It’s time to stop spending summers running through the sprinkler or wading in the community pool. The Bahamas are calling, and at Atlantis, Paradise Island, excitement ramps up to match the sizzling temperatures. With Grammy-winning artists, magical performances, and the return of the Cartoon Network™ summer fun, Atlantis is where all the cool kids (and adults) will be heading. Atlantis has epic summer events to match its epic destination. Sure, Atlantis is known for its exhilarating casinos, gourmet restaurants, and its shopping village, but it’s also known as a world-class entertainment destination with shows and performances to match. This summer, don’t miss these following acts. Saturday, June 13—Kicking off the summer are legendary artists Tony Bennett and Lady Gaga as part of the Atlantis LIVE concert series. A stop on the duo’s international Cheek to Cheek concert tour, this intimate performance will take place in the Imperial Ballroom with a capacity of only 4,000. June 24-September 6—Rob Lake, International Magician of the Year, brings his spectacular act of magic, illusions, and splendor to Atlantis all summer long. A great evening show for families, Rob performs Wednesday through Sunday nights at 8 p.m. in the Atlantis Theatre. Get a sneak peek of the sparks and shows below! July 4—And don’t think just because you’re in the Bahamas, you can’t celebrate the Fourth of July. In fact, Atlantis puts on a bash worthy of American Independence with a complimentary concert from R5 (frontman Ross Lynch plays Austin Moon on Disney Channel’s original series Austin & Ally), followed by a beachfront fireworks spectacular. August 21-22—The Miss Teen USA® Competition is back for its eighth year on Paradise Island with contestants from all 50 states and the District of Columbia. Watch as they are judged on three categories: swimsuit, evening gown, and interview. September 5—Atlantis ends the summer with another performance in its Atlantis Live concert series with a smash concert from country music superstar Keith Urban. With more 16 hit songs to reach number one on the charts and five consecutive platinum or multi-platinum albums, there’s no doubt every music lover can sing along with a few of his tunes. Back for a fifth summer of epic fun, Cartoon Network and Atlantis team up to bring the ultimate fun areas for young guests, and this year, HASBRO has joined the mix. With five distinctive events, sorry, parents, you might have to fight for your children’s attention on vacation. Back by popular demand, the CARTOON NETWORK™ LAGOON gives kids an Adventure Time-themed obstacle course. Oh, did we mention it was 9,000 square feet of inflatable obstacles? Oh, and it’s over water! With swings, slides, and jumps, this course is certainly an adventure. Who doesn’t remember grabbing a Super Soaker and attacking their best friend? At Atlantis, kids don’t just get a super soaker to play against their friends; they get the new NERF SUPER SOAKERFlood Zone. This interactive, inflatable maze for kids is the perfect battleground for an epic showdown. Children can meet their favorite characters at the Costume Character Parade in Marina Village, and Screen on the Green brings families and friends together three days a week on the grass area by Dolphin Cay for special screenings of hit Cartoon Network series. Atlantis Kids Adventure (AKA) will feature Cartoon Network-themed programming all summer along with themed games, arts and crafts, photos, and more. And of course you’ll want to cool down. Check out the water slides, river rides, pools, and beaches of Aquaventure, plus the marine fun at Dolphin Cay, in this episode of GOGO Vacations’ award-winning series, Paradise Found. So as the temperatures heat up, head to the destination that sizzles with excitement. 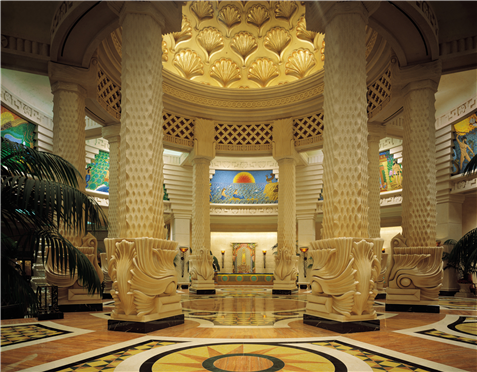 Atlantis, Paradise Island, sets the scene for an incredible summer getaway.